I approach each new Disney movie with a combination of eagerness and fear. Will it be as good as I want it to be? Where “Wreck-It-Ralph” is concerned, I knew within minutes that the answer was yes. I could tell from the look and sound of the film that it had the qualities I always sought in an animated movie. Talk all you want about 3D and technique, but at the end of the day, a good animated film depends on story and character and it’s those vital ingredients that make “Wreck-it-Ralph” so entertaining. It’s also a pleasure to see a movie meant for kids as well as arcade games junkies (I know I am). John C. Reilly is the right man to voice the title character, the villain in a retro video game who’s tired of being the “bad guy” for 30 years. His goal? To turn into a good guy. So he starts jumping into other video games, trying to play hero. But it’s no easy task, as you will see. With a neat premise like this one, you know you’re in for a treat. 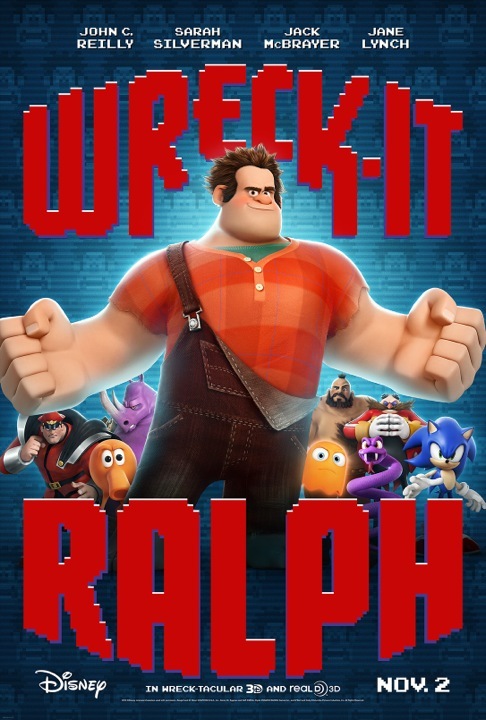 And make no mistake, “Wreck- it-Ralph” is brimming with imagination, humor, and references to old video games such as “Super Mario”, “Sonic”, “Pacman” and even “Street Fighter”. Director Rich Moore and his team have successfully made a movie that both grownups and kids can appreciate. It deserves to be a hit, and I hope it is.